The Conversation Project (TCP) has delivered countless presentations across the country about who we are and what our mission is. During these presentations, to help our audience gain a better sense of what we do, we share a video of our campaign that was featured on ABC World News with Diane Sawyer. In the segment, the camera follows the Jennings family as they have the conversation. The family sits in their well-furnished living room as they prompt the patriarch of the tribe to share his end-of-life wishes. They laugh and cry together as they reminisce on the past and touch upon vulnerable points of conversation. The video is incredibly poignant—you can’t help but be inspired to have the conversation with your loved ones. After showing this video, Kate DeBartolo (TCP’s director), tends to follow it by saying, “We know not all families look like this…” DeBartolo, who herself is a white woman, adds on, “We know that most families are not white, middle-class families.” And she’s right, most families don’t look like this. She says this as a reminder to the audience that “the conversation” is not simple and it becomes even more complicated when we take into account the identities of the people we aim to serve. When we say our mantra, “We want to ensure that everyone, everywhere expresses their end-of-life wishes,” we wholeheartedly mean everyone. Whether we’re engaging communities of color or non-English speaking communities, we must continue to educate ourselves about what end-of-life discourse looks like in various communities and within different cultural and racial contexts. 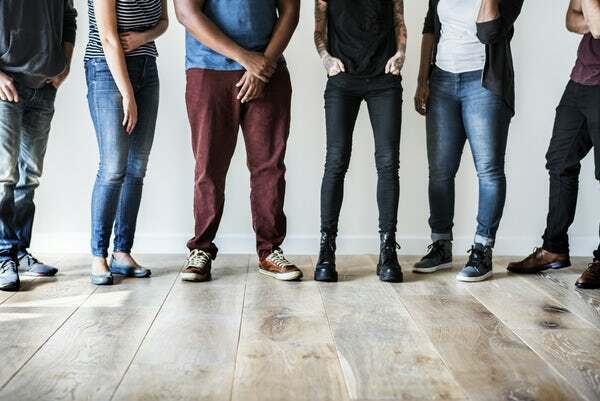 Below is a sampling of resources we found helpful on how to meaningfully and respectfully engage diverse communities, as well as key factors to consider. This list is by no means exhaustive, but can serve as a starting point to expand knowledge around the various challenges that add to the already complex experience of having the conversation. Breaking taboo, Chinese elders learn to express end-of-life wishes: This Boston Globe article highlights how a leader from Boston Senior Home Care led a group of Chinese elders in having the conversation. This piece is a great example of how uplifting, acknowledging and honoring cultural norms can lead to a breakthrough. Dying Better in Chicago: After the death of her husband, Randi Belisomo was inspired, in collaboration with her husband’s oncologist, to start Life Matters Media and a program called Starting the Conversation, encouraging residents of Chicago to have conversations about end-of-life wishes. In this piece, Belisomo acknowledges the role race plays in having these conversations. Honoring Cultural Diversity at the End of Life : This piece, though geared specifically towards social workers, is an astute examination of the importance of culture and how it impacts end-of-life care. Cultural Relevance in End-of-Life Care: Nurse Practitioner, Phyllis R. Coolen, performed a literature review, interviewed health care providers and referenced her own clinical experience to collect data that reflects the role culture plays in end-of-life care decisions and how vital it is for providers to be cognizant of its role. Race at the End-of-Life: An eye-opening piece, this article begins by uplifting the historical disenfranchisement experienced by the Black community under the U.S. healthcare system, then explains how the repercussions of this history manifests itself today (specifically as it pertains to end-of-life care discussions, care and treatment) and finally offers possible solutions to addressing the issue at hand. Getting Real About Racial Inequities at the End of Life: A video where Jessica Zitter, MD, Pastor Corey Kennard and Rev. Cynthia Carter Perriliat discuss the anxieties people of color (specifically, Black people) understandably experience when they are faced with end-of-life conversations and decisions. Avoiding Cultural Assumptions in Palliative Care: On this podcast, two palliative care physicians talk about having a “what matters” mindset rather than “what’s the matter” approach when interacting with seriously ill patients. They answer questions regarding helping families navigate a complex health care system in a way that honors their culture. 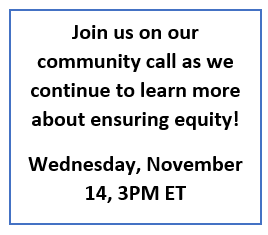 Join us on our upcoming community call, November 14th from 3:00-4:30, on ensuring equity and reaching diverse communities in our work to promote end-of-life conversations. This call will feature the Chinese American Coalition for Compassionate Care, Bethel AME Church, and the Board Resource Center and lessons they’ve learned while engaging communities of color, non-English speakers and other marginalized communities. And, we will engage all participants in open discussion and learning. Click here to register for the call!